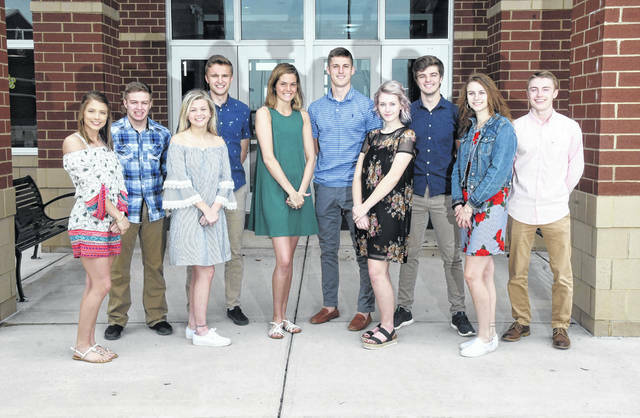 Ben Robinson | For Miami Valley Today Covington High School Prom king and queen candidates include, left to right, Ashlyn Plessinger, Keringten Martin, Sarah Remley, Tyler Fraley, Lillian Hamilton, Gray Harshbarger, Madison Williams, Caleb Rawson, Leah Poling, and Chad Yohey. Covington’s Prom will be held Saturday, April 27 beginning at 5:30 p.m. at Stillwater Valley Golf Club, Versailles. This year’s theme is “Glitter and Gold.” An After-Prom event will follow at the high school. Covington High School Prom king and queen candidates include, left to right, Ashlyn Plessinger, Keringten Martin, Sarah Remley, Tyler Fraley, Lillian Hamilton, Gray Harshbarger, Madison Williams, Caleb Rawson, Leah Poling, and Chad Yohey. Covington’s Prom will be held Saturday, April 27 beginning at 5:30 p.m. at Stillwater Valley Golf Club, Versailles. This year’s theme is “Glitter and Gold.” An After-Prom event will follow at the high school. https://www.tdn-net.com/wp-content/uploads/sites/21/2019/04/web1_Covingtonprom.jpgBen Robinson | For Miami Valley Today Covington High School Prom king and queen candidates include, left to right, Ashlyn Plessinger, Keringten Martin, Sarah Remley, Tyler Fraley, Lillian Hamilton, Gray Harshbarger, Madison Williams, Caleb Rawson, Leah Poling, and Chad Yohey. Covington’s Prom will be held Saturday, April 27 beginning at 5:30 p.m. at Stillwater Valley Golf Club, Versailles. This year’s theme is “Glitter and Gold.” An After-Prom event will follow at the high school.